DATA ALONE CAN REVEAL THE FIRST LEVEL OF VIRTUES IN A DUPLEX – THAT THEY HAVE RELATIVE scarcity, a tendency for higher velocity, and a propensity for higher prices. But, to be certain, duplexing is not right for every address. Data points like these can be dangerous without understanding the nuance behind them. Simply connecting two floors with a staircase doesn’t increase their value per square foot. The attraction to the duplex is truly found in the artful margins: the opportunities to craft more intriguing layouts, to carve out escapes from the traditional open floor plans, and create environments that engage blends of seclusion, openness, and connectivity – particularly with outdoor environs. “For very many people around the world, a house is a two-story dwelling, with living and entertainment rooms downstairs and bedrooms above. A duplex is such a house inside an apartment house. I love duplex apartments. If the stair hall is spacious enough, and the tread and riser dimensions are gracious enough, a duplex makes a wonderful kind of home. Some duplexes, based on the artist’s studio model, incorporate a double-height living room, and that can work beautifully if the living room is big enough in proportion to the height; no one wants to sit at the bottom of a well. I think we’ve done a good job of it on a number of apartments at 30 Park Place. There are also some apartments that were developed in New York in the 1920s and 1930s with clever half-level arrangements that I admire very much, a kind of hybrid duplex that Le Corbusier also explored. 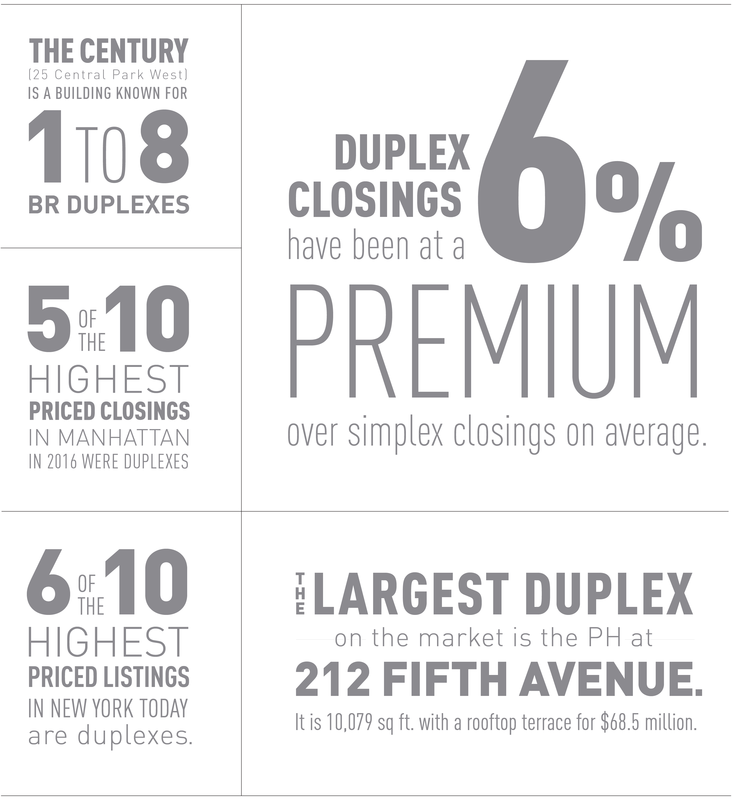 There are 178 duplexes on the market today with PRIVATE OUTDOOR SPACE. Soho, Tribeca, and the Upper East Side have more duplexes with private outdoor space than other neighborhoods. The smallest duplex on the market is 200 West 78th Street. It is 596 square feet and it is on the market for $879,000. 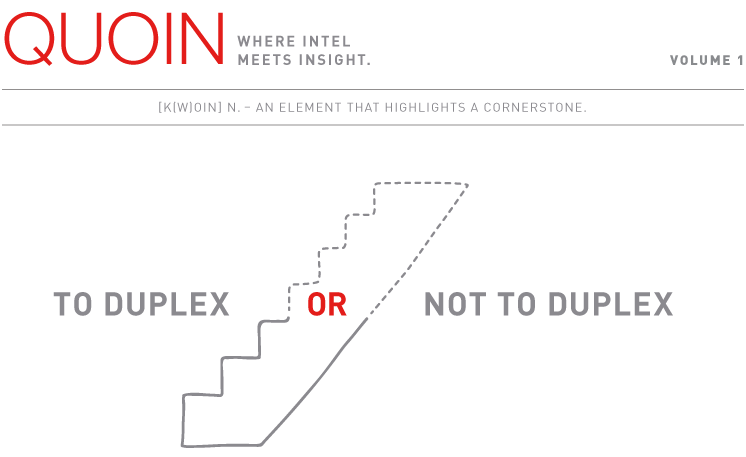 To receive Quoin insights in your inbox, subscribe.